is a well-known fishing hole and provides some of the best trout fishing in the area. This is the ideal spot for boat fishing because of its size. Starting on opening day through July 31 there is a five fish limit with no size limitations. Aug.1 - Oct.31, it's two per day, 18" in length and only artificial lures with barbless hooks can be used. is located on Lake Mary Road in the scenic mountain area. The basin consists of 4 lakes - Lake George, Lake Mary, Twin Lakes, and Lake Mamie. Stocked often, this area has several campgrounds, and a general store. There are no fishing restrictions on these lakes and fishing is good all season once the snow melts. If you are looking for a real wilderness experience take a mile hike or more to the many hidden lakes scattered throughout the backcountry from the Lakes Basin. Crystal Lake, Barrett Lake, TJ Lake, McLeod Lake and Skelton Lake are all within walking distance and provide good fishing adventure. is sure to provide a great fly fishing excursion. The fish are around 12 inches long, some larger. The river begins at Thousand Island Lake, 10 miles north of Mammoth. This river is one of the local's favorite. is world famous for its fine fishing. Catch and release with barbless artificial flies only. This is the only place in the area where the fish population is all natural. Fish up to 18" are regularly caught - so don't forget the camera! runs right through town along Old Mammoth Road. Walk from your condo and fish at your leisure. Stocked regularly, it is the perfect spot for that time when you only have an hour to fish. Nice picnic area and playground in the park. is nestled in the canyons of the McGee Mountains just south of town. Lots of trees and several picnic areas provide for a relaxing afternoon. The fish are on the smaller side, but the views are fantastic! Owens River offers wide-open spaces for the fly fisherman. Plenty of room for everyone. Located just south of Mammoth off Hwy. 395 off Benton Crossing Rd., (at the green church), go 3 miles to the bridge. Catch should be favorable most days. is a small, deep lake surrounded by majestic mountains on 3 sides. A popular spot for catching the big one! Boat rentals and a launch ramp are available. Shade picnic areas, a general store and a great restaurant make for a nice day trip. The area is home to twelve lakes, beginning with Rock Creek Lake that sits at the end of the road. With a little hike along the canyon trails you will reach Serene Lake, Eastern Brook Lake, Mack Lake, Marsh Lake, Hidden Lake, Ruby Lake, Heart Lake, Summit Lake, Golden Lake, Patricia Lake, and Box Lake. Pick one and try your luck. Located near Tom's Place off Hwy. 395 south of Mammoth. just adds to the amazing places for anglers to go. The June Lake Loop is a breathtaking drive with surrounding mountain scenery. It offers a variety of lakes and flowing streams. June Lake, Gull Lake, Silver Lake and Grant Lake are easily accessible without any hiking. Boat rentals are available at Grant Marina. 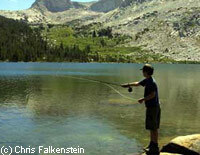 provides year-round fishing below Crowley Lake. The drive down from Mammoth is approximately 35 minutes and expect the temperatures to be around 15 degrees warmer. It's a great place to go in the winter months after a morning of alpine skiing or snowmobiling. Wild trout are plentiful and certain areas are catch and release sanctioned. is a great backcountry fishing trip if you can handle the 10-mile round trip hike. Located outside of Agnew Meadows, some of the terrain can be steep. The scenery is spectacular and the catch will be native wild trout under 12". A perfect place for the avid fisherman looking for new adventure! Local shops offer gear, supplies, guides and fishing tips - everything you need. has spectacular cliffs, in a remote setting that is free from crowds. This is the gateway to the best Golden Trout fishing in the entire Sierra. Look for Bighorn Sheep, Mountain Lions and Golden Eagles in the high cliffs above the road. Bring binoculars. has become a scenic mecca of sorts for the rock climbing crowd. There is great fishing, hiking and wildlife viewing all in one. Temps can be too hot in the summer, but otherwise, it's usually just right as there is a lot of shade. Be wary of stinging nettle plants along the waterways. Access is from Highway 395, 10 miles north of Bishop at the Owens Gorge Pipeline Road. Drive all the way to the top for the best view of the gorge from a car. See the Marinas in Mammoth to find boat rentals, and Mammoth fishing guides and suppliers of tackle to make the trip memorable. If you're looking for a mecca for trout, you may want to take a day trip and go trout fishing in Lone Pine. But don't tell a soul.